Large Playing Cards for Visually Impaired and some can even be Personalized. High Quality Bicycle Customizable Low Vision Playing Cards. Plastic coating for longevity and Extra Large Print Playing Cards Macular Degeneration. Personalized Playing Cards are fun to receive too. See my Instructions below or call Linda and I will do it for. Sports Playing Cards too are very popular. People also love Max the Gentle Giant Bullmastiff. These Customizable Low Vision Playing Cards by Bicycle are High Quality Deck of Cards and the Printing is Outstanding and detailed. See the large image below on How to Create Your Own Playing Cards Online with Instructions too. 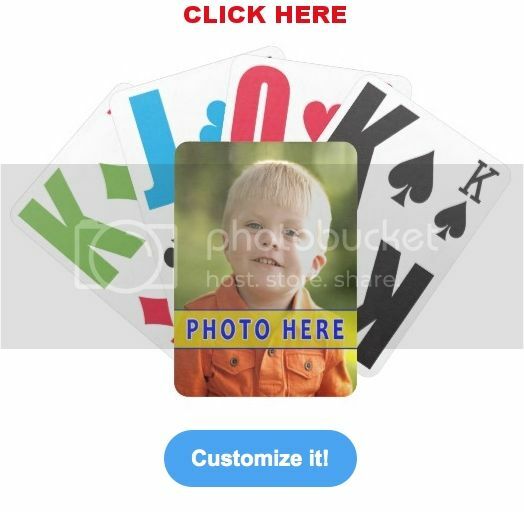 You can choose Regular Print or Personalized PHOTO Deck of Cards. This one is the Largest Print. Zazzle also offers a Jumbo print with Large characters but not nearly as big as these. Choose from many fun styles. See the INSTRUCTIONS on how to create Photo Personalized Playing Cards. Great gifts for visually impaired. Large Playing Cards for Visually Impaired. 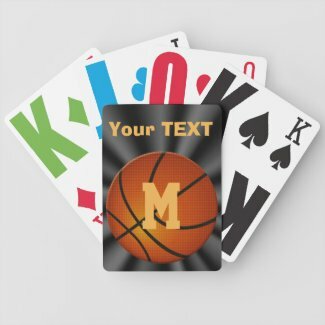 Many are Personalized Playing Cards with YOUR TEXT and or YOUR PHOTO. Type in Your Own TEXT into the Text Box Template which is within the “Personalize it” Section. Click the blue word “Change” located beneath my temporary image of my grandson. Then CLICK the Blue Button “Upload New Images” and then the White Button “Select Images to Upload”. Pick out your best Photo from your personal computer. Then CLICK “OK”. See the Image below for Visual Instructions. That always helps me. If you would like me to do this for you, please Call Linda at: 239-949-9090. Once you are on the Jumbo Print Playing Cards, Click the tiny blue word “Change” and follow the prompts to Upload YOUR PHOTO. Imaging their smile when they see your cute photo and then notice how huge the playing cards are making it easier to play cards with their friends. These Low Vision Playing Cards by Bicycle are of the highest quality including plastic coating for durability. Zazzle’s products are ALL 100% Love it Guaranteed and Less than 1% of products are ever Returned to them. Quality Brand Name Products, Unsurpassed Printing and Fast Service make them the Best. Give a gift of fun for someone who is suffering from poor vision and who loves playing cards. Make it extra special with these “Personalizable Gifts”. Most of the Text on the Low Vision Playing Cards can be changed to Mom, Dad, Grandpa, Grandma or their personal name. On a Trip to African, my brother took this photo of a beautiful young African Giraffe in the Wild gingerly grazing on a tree. I love this photo. Choose any style print too. Type in YOUR TEXT where you see the text box beneath “Personalize it” on the Large Playing Cards for Visually Impaired product page. 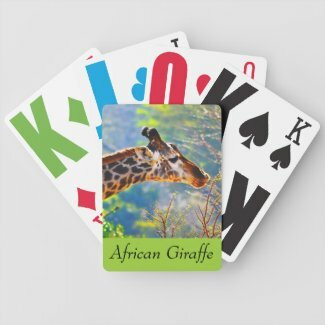 Personalized Photo Deck of Cards with HUGE NUMBERS with YOUR TEXT instead of “African Giraffe” if you wish. Choose a smaller printed deck of cards. Here is How to Design Your Own Playing Cards with YOUR PHOTO. If you need to Re-Size or Move Your Photo, Click the Blue “Customize it” Button under the big playing cards image. Click Your Photo which is now on top of the Playing Cards and Drag it by the tiny gray boxes on the Dotted Lines. Call Linda if you need any help or would like to make changes to any of my designs. Choose the Style of the Personalized Deck of Cards under the “Styles Options” area. 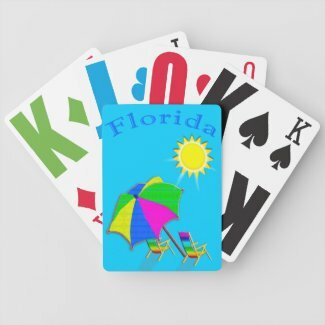 I underlined the Large Print Playing Cards but you can choose any of these cool styles. Type in your Monogram and Text in the TEXT BOXES under the “Personalize it” area. Great personlizable gifts. You can choose your Style of the Low Vision Playing Cards by Bicycle in the “Style Options” area. Type Your MONOGRAM or NAME in the TEXT BOX under the “Personalize it” it section. You can choose these same Deck of Card designs with a Regular Print or Fun Print. See “Style Options” to change the Style of Print. 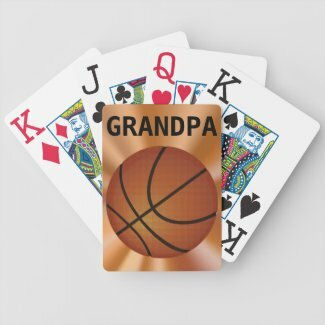 These are great Personalized Gifts for Grandma and Grandpa who love to play cards and love to show off their family to the friends. If they have a difficult time seeing regular cards, be sure to choose the Large Print Playing Cards or the Low Vision Playing Cards. If you know someone who has difficulty seeing and love playing cards, these are great gifts for visually impaired and low vision. 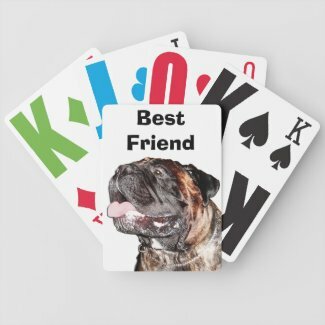 Personalized Playing Cards make them extra special. Most of these Photographs on this page are Large Playing Cards for Visually Impaired by Little Linda Pinda. The Jumbo Print Grandma Cards are by another designer. You will appreciate the Bicycle Playing Cards Quality and Zazzle’s amazingly vibrant printing technique. Beautiful. Large Print Playing Cards for Macular Degeneration. You can change any cards to any of the available print styles including the E-Z See LoVision I featured or the Jumbo Large Print Cards or one of the many regular. This entry was posted in Little Linda Pinda, LLC and tagged cards, Create Your Own Playing Cards Online, custom, deck of cards, degeneration, Design Your Own Playing Cards, gifts for visually impaired, huge print, impaired, jumbo, jumbo print, jumbo print playing cards, Large Print Playing Cards, Large Print Playing Cards Macular Degeneration, Large Print Playing Cards Visually Impaired, low vision, low vision gifts, Low Vision Playing Cards, Low Vision Playing Cards by Bicycle, macular, macular degeneration, monogram, monogrammed, personalized, Personalized PHOTO Deck of Cards, Personalized Playing Cards, photo, playing, poor, vision, visually, visually impaired, Where to Get Large Pictures Printed by admin. Bookmark the permalink.